Tillage erosion is the loss and accumulation of soil within a landscape resulting directly from the translocation of soil by tillage (tillage translocation). The horizontal movement of soil by tillage is called tillage translocation (Box 3). Soil translocation by tillage is char acterized by how much soil is moved and how far it is moved. It is measured as a mass ofsoil translocated forward per unit width of tillage or as a mass of soil translocated laterally per unit length of tillage (Figure 1). It can also be measured as an average distance moved across a unit width of tillage or along a unit length of tillage. The soil translocation by one sequence of conven tional primary and secondary tillage (one pass of moldboard plow, two passes of tandem disk, and one pass of field cultivator) is about 100 kg per meter width of tillage (average displacement of about 0.40 m), with some of this soil being displaced in excess of 2.5 m. Far greater distances have been measured (Tables 2-4). The extent of soil translocation provides a measure of the horizontal distance over which soil is mixed or dispersed within the till layer. This is important infor mation in assessing the rate and extent of dispersion of soil constituents (products, amendments, or contami nants). Understanding tillage translocation and its variability is very important to controlling soil erosion. The greater the distance soil is moved, the more likely it is to differ between upslope and downslope tillage, and the greater the amount of soil moved, the greater this difference will be in terms of soil mass. 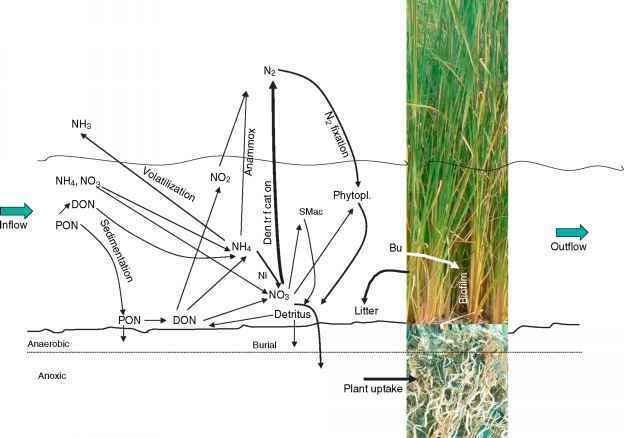 Net soil movement results in soil loss and soil accu mulation (Figure 2). Historically, the study of soil movement by tillage has been carried out by agricultural engineers. The focus of this research is the forces operating during tillage and the interaction between tool and soil the discipline of soil dynamics. The purpose of this research is to design tillage tools and implements that are more effective and more efficient. Only recently, soil scientists and agricultural engineers have begun to examine the horizontal soil movement by tillage the discipline of tillage translocation. The purpose of this research is to minimize soil erosion caused by tillage translocation and to manage the spatial and temporal dynamics of soil properties and processes. terraces on the downslope side and burial of soil on the upslope side (Figure 3). Tillage erosion is described in terms of landscape erodibility and tillage erosivity. Landscape erodibility is the propensity of a landscape to be eroded by tillage, and is a junction slope gradient (0), slope curvature (0), and physical properties of the soil. Slope gradient affects the impact of gravity on the mass of the soil displaced by tillage and on the combined mass of the tractor, implement, and the soil being carried by the tillage tools. As a result, drawing a tillage implement over nonlevel surfaces causes leveling. As well, planing is caused by drawing a fixed frame implement over nonuniform, curved surfaces. Tillage erosion is compounded in landscapes which are dissected with fence lines, terraces, etc. Each discontinuity in slope creates an additional position within the landscape where soil is lost (downslope from the discontinuity) and accumulated (upslope from the discontinuity). Soil proper ties which affect either the weight of the soil (e.g., density and moisture content) or the soil's resistance to displace ment (e.g., texture, structure, and moisture content) also affect the power requirement for tillage. Variability ofthese properties will affect translocation, and, therefore, tillage erosion. Typically, topographically complex landscapes (those with many short, steep, and diverging slopes) are most erodible. Tillage erosivity is defined as the propensity ofa tillage operation, or a sequence ofoperations, to erode soil, and is a function of the design of the tillage implement (combi nation, arrangement, and shape of tillage tools), the operation of the tillage implement (depth and speed), the suitability of the tractor-implement match, and the behav ior of the tillage operator. Tillage depth determines the amount of soil translocated and tillage speed determines the amount of energy imparted by the tillage tools on the translocated soil. Each tillage implement has a recom mended depth and speed of operation. When operated as recommended, tillage depth and speed vary in complex landscapes in response to changing power requirement and availability. Variation in tillage depth and speed causes tillage translocation to vary and, therefore, causes tillage erosion. This variation in tillage depth and speed is ampli fied if an implement is operated in excess of recommended depth and speed, or if the tractor used has less than the recommended available power to draw the implement. The manner in which the operator manipulates tillage depth and speed in response to changing power requirement and availability can also affect the erosivity of tillage, for exam ple, it is an erosive practice to employ high speeds during downslope tillage to recover working time lost due to deceleration during upslope tillage. Typically, large imple ments, equipped with aggressive tillage tools, operated at great depths and high speeds are highly erosive, with more passes resulting in more erosion. aTL, average distance of soil movement in till layer; A90, distance to which 90% of translocated soil is moved; Tm, mass of soil moved per meter width tillage; 0, mass of soil moved per meter width of tillage per percent of slope grade (+ve downslope). bExperiments carried out in Ontario, Canada, 1990. cExperiments carried out in New Brunswick, Canada, 2005.
dDisk following moldboard plow, and cultivator following disk following moldboard plow. 3Tl, average distance of soil movement in till layer; A90, distance to which 90% of translocated soil is moved; Tm, mass of soil moved per meter width tillage; 0, mass of soil moved per meter width of tillage per percent of slope grade (+ve downslope). bThe planting operation with disks followed by two passes of hilling tools. cExperiments carried out in New Brunswick, Canada, 2005.
aTL, average distance of soil movement in till layer; A90, distance to which 90% of translocated soil is moved; Tm, mass of soil moved per meter width tillage; 0, mass of soil moved per meter width of tillage per percent of slope grade (+ve downslope). bExperiments carried out in Manitoba, Canada, 2004. cExperiments carried out in Saskatchewan, Canada, 2006. (ß 86 + 7 80) 8s where A is the rate of soil loss (kg m 2yr 1); M is the mass of soil per unit area (kgm 2) above some specified base elevation, zo (m); p is the bulk density of that soil (kg m ); t is time, which is usually expressed in years, but it can also refer to a single tillage operation or a sequence of operations (p); s is a length in any specified horizontal direction (m); and TM is the mass of translo cated soil per unit length perpendicular to the direction of s (kg m 1 yr 1). Figure 2 Soil movement and erosion by tillage in hilly landscapes. Arrows indicate the magnitude of soil movement by tillage. 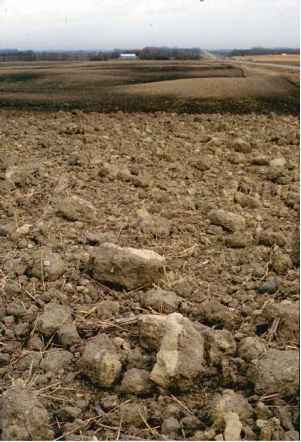 Figure 3 A landscape (Minnesota, USA) that is severely eroded by tillage erosion, showing topsoil loss and subsoil exposure on hill tops. where TM is the translocation unaffected by slope gradient or slope curvature, which would occur on a horizontal surface (kgm 1 yr *); ft(kgm 1o/o 1 yr *) and 7(kg m 1(% m 1) 1 yr 1) are coefficients which describe the additional translocation resulting from slope gradient and slope curvature, respectively; and TM (ATm) is the net translocation which occurs either as a result of changing topographic conditions along the path of tillage or as a result of tillage in differing directions at a single point in the landscape. The magnitudes of ft and 7 characterize the erosivity of tillage (Tables 2-4). The ranges in 0 and 0 characterize, in part, the erodibility of the landscape. The loss of topsoil and exposure of subsoil on upper slopes normally amplifies the variability in soil properties affecting crop production and other biophysical processes. Tillage erosion not only redistributes soil within a land scape, it also leaves the soil more susceptible to wind and water erosion by exposing subsoil which is more erodible and by delivering topsoil to areas of the landscape where water erosion is more severe. Recent research suggests that tillage erosion is the major cause of soil loss on the hilltops of cultivated landscapes. Compared to wind and water erosion, however, tillage erosion has only recently been recognized by the scientific community, with rela tively few studies conducted around the world. Tillage erosion is a serious concern for the sustainability of crop production on some landscapes.